Dolours spoke about her staunchly Republican parents, her father who had bombed England in his youth, her aunt who lived with them and who had lost both hands and eyes in an explosion when she was only 25 and how she had to hold a cigarette to her aunt’s mouth so she could have a smoke. 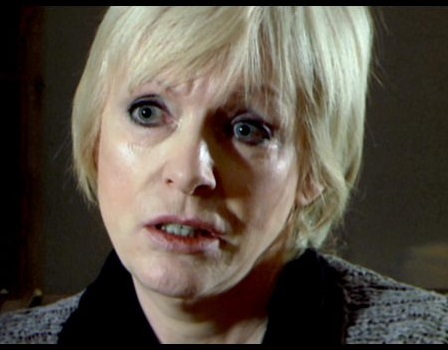 Dolours told how, when she got a visit from her mother and wept in her arms, her mother told her not to let the bastards see her crying, never let them see you crying she told her. What both Dolours and Marian experienced during their prolonged hunger strikes and forced feeding in prison in England would have broken most people and the experience was so bad that they both became anorexic. Then there was the issue of the ‘Unknowns’, where she played a part in that she drove those about to be executed and disappeared across the border to their deaths. She said that Jean McConville admitted to being an informer and that she was arrogant in her belief that she wouldn’t be shot, so much so that when the two were alone in the car, McConville, not knowing that Dolours was in fact an IRA Volunteer, said to her, “I knew the Provo bastards wouldn’t shoot me”. Dolours said that the IRA in Louth wouldn’t shoot a woman so three volunteers were brought in and they took her to a ready dug grave where each one shot her before a Louth volunteer buried her. No names were mentioned. Joe Lynskey was the last of the ‘Disappeared’ whom she spoke about. He wasn’t an informer but had set up another Volunteer to be shot because he was having an affair with the volunteer’s wife. She told how Lynskey had accepted his fate and had taken an overnight bag with him as they travelled over the border in a car. She said she didn’t want to do what she was doing but it had to be done and she hoped that Lynskey would punch her in the face and run off and get a ferry. He didn’t and she left him with other IRA Volunteers having said their goodbyes. During this whole film only Gerry Adams was mentioned by name twice and a member of the ‘Unknowns’ who had died in America. Ed Moloney said after the film that this person had in fact become a screw in America before he died of cancer. Go and watch this powerful film and you’ll not see someone ‘touting’ on her comrades but a truly courageous woman who carried out orders and had to live with what she had done to the end of her days. Look into her haunted eyes and you’re looking into the soul of someone who went through what she and many others went through only to be betrayed eventually. Try telling me that this wasn’t a story that had to be told. Ed Moloney spoke at the end about the project and the reasons it was shut down and he did say that the IRA volunteer who dug Jean McConville’s grave was working for the Gardai and was saved from the same fate because his father was a leading member of the Movement in Louth. The most shocking thing about this, he said, was that the authorities in the South are aware of where McConville’s body was buried but choose to keep silent about it. Posted on December 5, 2018, in 21st century republicanism and socialism, British state repression (general), British strategy, Civil rights movement, General revolutionary history, Historiography and historical texts, Interviews, Irish politics today, Partition, Prisoners - past, Provos - then and now, Repression and resistance in 1970s and 1980s, Republicanism 1960s, Reviews - films, Revolutionary figures, Unionism, loyalism, sectarianism, Women in republican history, Women prisoners. Bookmark the permalink. Comments Off on Film Review: I Dolours.